Since I am an official blogger partner to social media statistics site Socialbakers, I will be posting monthly country reports about Swedish Facebook pages from now on. The first report is for November 2011 (data from Oct 25 to Nov 24) and can be found below. As you can see, there are almost 4.5 million Swedish Facebook users and the top brand in terms of number of fans is the candy Hallonlakritsskalle. 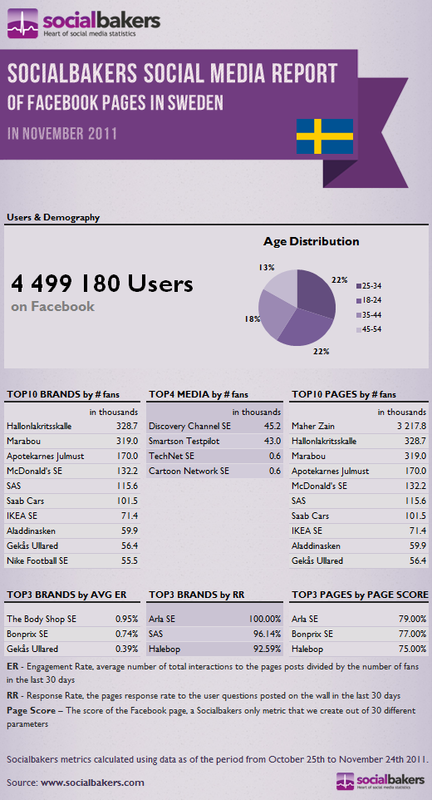 Top page overall in terms of number of fans is the Swedish/Lebanese singer Maher Zain with 3.2 million fans. The highest level of engagement can be found on the Body Shop’s Swedish page, while Arla has the highest response rate (100% responses to questions on the wall page during the last 30 days) and also the highest Page Score (a Socialbakers metric made up of 30 different parameters). There are some pages that would make it to the top ten and if you would like to suggest missing pages to Socialbakers you can do it here. I will add a few that I know of.